This is a newbie, basic, 101, binding class. 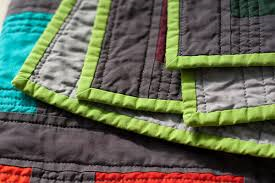 If you've NEVER put a binding on your quilt then this is the class for you! Learn how to measure for your binding, learn about different widths to cut, how to prep and apply your binding and connect the two loose ends. Then, you will learn to hand sew your binding and how to machine sew your biding. After this class, you'll be ready for the Intermediate Binding Class. Please have the supplies cut & ready to work prior to class time. This is a learn & practice piece so you don't have to have pretty fabric. Quilting Ruler, suggest 6" x 12"
Walking foot for your sewing machine or 1/4" seam presser foot. Requirements: Cancellation Policy Thank you for signing up for a class at Not Your Mama’s Quilt Store. Due to the high number of late-notice cancellations, our cancellation policy has been updated: In the case that you are unable to attend the class, you must cancel at least 5 days prior to class date for a FULL refund. If you cancel 3-5 days prior to class, there is a 50% forfeiture fee deducted from your class fee. You may choose to transfer to another class if available, with a $20 transfer fee plus additional registration fee if applicable. If you cancel less than 3 days prior to class, your class fee is 100% forfeited. Transfer to another class is not available with less than a 3 day cancellation.